I am a sucker for silver trays… seriously, if we’re at a thrift store and there’s one – I buy it. I love the old-school look to them (the more ornate the better) and at around $2, why not? I use them for everything – to hold candles and pens on my desk (see it HERE), on our bedside table for miscellaneous stuff (see it HERE), to hold paper and pens in the kitchen for writing down messages/appts, to serve food on, to hold my husband’s jewelry on a mirrored table in our guest room, etc. I think they’re wonderful until they start to tarnish and by the time they turn almost black I start dreading having to polish them. There’s lots of ways to do so, with a silver cloth, with silver polish, with specialty cleaners, etc but let’s face it they’re all a pain. Last Friday while cleaning the house, the tray on our beside table (see it HERE) was REALLY starting to bother me. I was on a roll cleaning and didn’t want to stop to go to the store to get something to polish it so after a quick Google search I discovered the best secret EVER… toothpaste. That’s it, nothing special and any toothpaste will do (mine was an orange foaming whitening paste we’d gotten for free in a travel size with a coupon lol) and it couldn’t be easier. Seriously, you can see by the clock in the before and after pics this took me just under 10 minutes to complete and the tray looks like new. I did all the trays in the house and was so happy to have figured this out! 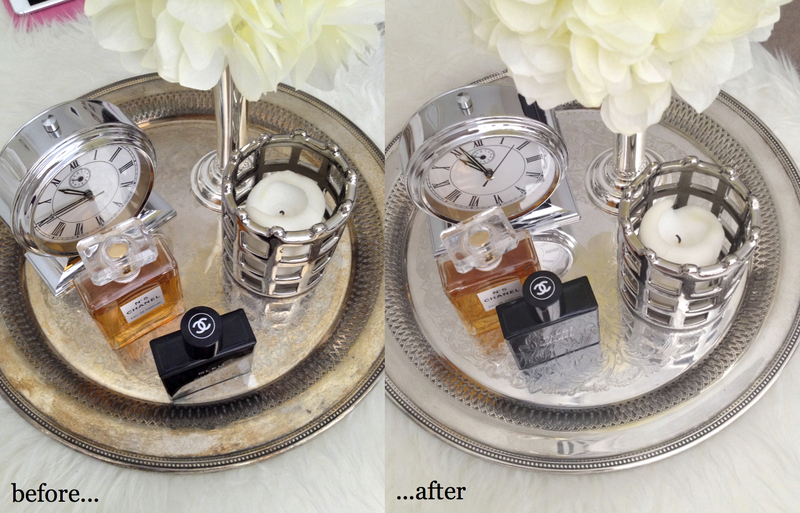 Next time you’re at the thrift store and want to pass over a tarnished silver tray, don’t! Use this super simple tip and shine it up to it’s original beauty! This is a lot easier if you use an old toothbrush, especially if you’re trays have really intricate designs like mine do. Squirt a generous amount of toothpaste on your brush and moisten it with water. Start with a small section and rub the toothpaste on to the surface (1). Once the paste is spread out a little, work in circular motions with your toothbrush until you see the tarnish has started to come up (2). Run the spot under warm water to remove the paste and then dry with a clean cloth (3). Continue around the whole tray until the whole thing is “polished” and make sure to thoroughly dry the tray! Great tips! I too like collecting places to hold candles and jewelry. I love hearing that I’m not the only one! Such a cool and inexpensive way to hold and display all the random items around the house! If your trays are sterling silver or silver platted, doesn’t the toothpaste harm the silver? I have only tried on a few trays but I haven’t had any problems!